Ever wonder what it takes to pull together our web chat series? The chats usually consist of two components, live streaming and web chats. 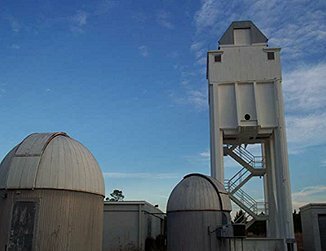 The Automated Lunar and Meteor Observatory, or ALaMO, at NASA’s Marshall Space Flight Center in Huntsville, Ala., is where the live streaming component of “Watch the Skies” begins. The ALaMO consists of two observatory domes, a 15 meter (50 ft.) tower with a roll-off roof, and an operations center with laboratory space. Inside the tower and one of the domes are 14′ Schmidt-Cassegrain telescopes equipped with focal reducers and astronomical video cameras. Once the roof rolls back or the dome opens up, the telescopes have easy access to the day and night skies. The moment the telescopes or wide field astronomical video cameras are pointed, a fiber optic cable line is connected to the camera in order to send real time images to Marshall television. Inside of Marshall’s NASA TV, our audio visual experts go to work uploading the live streaming to our online community group. With the click of a mouse users are able to see the live feed from the ALaMO. Simultaneously, online users and NASA experts are tuned in with our online user community late nights to watch the skies together, via web chats. The Marshall public and employee communication team develops the information to promote the chat via nasa.gov and through social media. Additionally the communication team transcribes our expert’s answers to the chat room and moderates the chat. 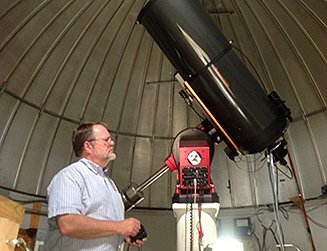 Whether it is Venus in transit, meteor showers, or observing planets our NASA expert’s role is to answer questions from the public. Besides the web chats and contributing to the Watch the Skies blog series, the Meteoroid Environment Office’s daily work includes modeling meteor showers, analyzing lunar meteoroid impact data, and examining meteor observations. Next Next post: Geminids: How Low Do They Go?